India electric motors market is driven by growing awareness towards energy conservation, surging acceptance of electric vehicles, and improving industrial infrastructure in the country. The market is further fuelled by growing HVAC industry, rapid urbanization, and stringent regulations toward power consumption. Electric motors are attributable to nearly 30% of the power consumption in the industries. Manufacturers are continuously coming up with product innovation and improved technologies in motor drives. Energy efficient motor is the upcoming trend in the electric motors market. According to 6Wresearch, India electric motors market size is projected to grow at a CAGR over 6% during 2017-23. AC motor led India electric motors market share in 2016 and is projected to dominate during the forecast period. Among voltage levels, low voltage motors segment bagged highest revenue share in 2016, however, with growing usage in industrial segment, medium voltage is projected to exhibit highest growth in India electric motors market forecast period. Electric motors are equipped across all the segments, industrial segment recorded above 50% revenue share in 2016. Further, growing adoption of electric vehicles are likely to assist largely towards electric motors market growth over the coming years. The segment is anticipated to display highest growth during 2017-23. 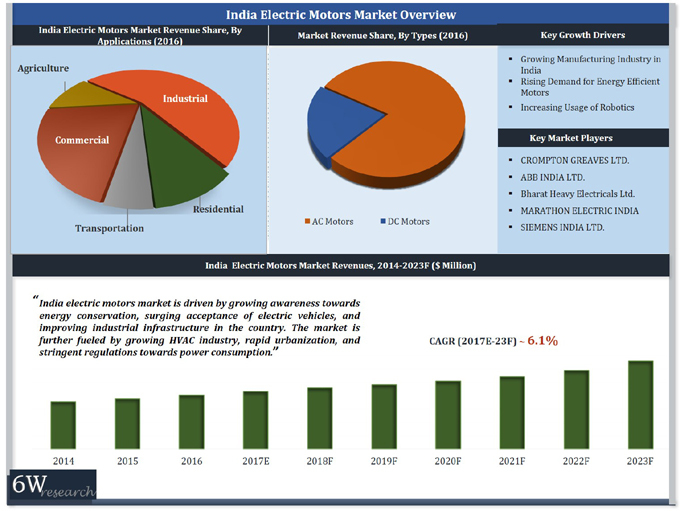 The India electric motors market report thoroughly covers market by types, voltage levels, power capacity, applications, and regions. The India electric motors market outlook report provides an unbiased and detailed analysis of the on-going India electric motors market trends, opportunities/high growth areas and market drivers which would help the stakeholders to decide and align their market strategies according to the current and future market dynamics. 13.4	Bharat Heavy Electricals Ltd.
13.7	WEG Industries (India) Pvt. Ltd.
13.7	Kirloskar Electric Company Ltd.